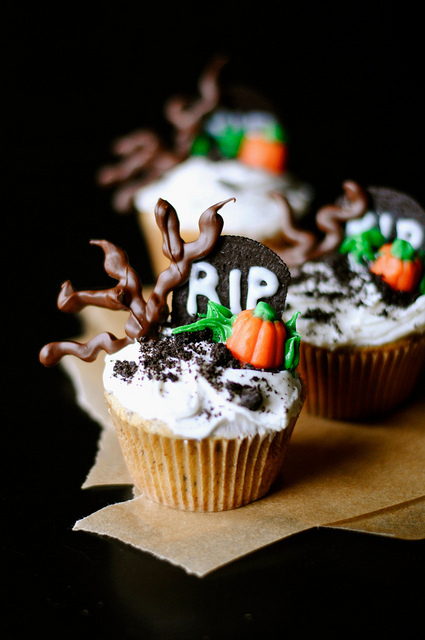 I wish all graveyards looked like these cupcakes! They're so cute, but there's definitely something spooky about them. Not only are these cupcakes cute, they're Oreo cupcakes, which are definitely in my top five favorite cupcake flavors. They're topped with Oreo tombstones, chocolate trees, and candy corn pumpkins. Again, I wish all graveyards were this cute! To check out the how-to, head on over to How To: Simplify! I admire the effort put into these lovely cupcakes! If this were presented to me, I'd actually feel bad about eating it because it's so pretty! These are great... I love the addition of the candy corn pumpkins.